The National Film and Sound Archive of Australia is proudly presenting 'The Dressmaker Costume Exhibition' from April 18. Don't miss this very special opportunity to see stunning original haute couture costumes created by award-winning designer Marion Boyce. Worn by the likes of Kate Winslet, Liam Hemsworth, Sarah Snook, Hugo Weaving, Judy Davis and Rebecca Gibney in the hit 2015 film The Dressmaker, this unique exhibition celebrates the artistry of the film's sumptuous designs, as well as the transformational power of fashion. In The Dressmaker, Paris-trained fashion designer Tilly Dunnage (Kate Winslet) arrives in the sleepy country town of Dungatar in the early 1950s, she is no stranger to the locals. She sets about transforming the townspeople through fashion – from quiet Gertrude Pratt (Sarah Snook) to eccentric Sergeant Farrat (Hugo Weaving). Soon life in Dungatar will never be the same. There will be revenge, love and tragedy. Justice will be swift … and very well-dressed. Go 'behind the seams' of a diverse range of elegant vintage fashion and discover how the film's vision was brought to life by an extraordinary creative team: director Jocelyn Moorhouse, producer Sue Maslin and author of The Dressmaker, Rosalie Ham. 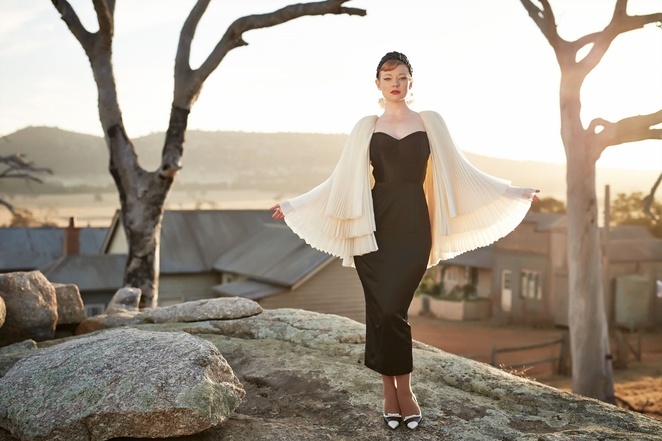 The Dressmaker earned Boyce multiple awards including Best Costume Design at the 2015 AACTA Awards. Boyce has also been nominated for an Emmy and Costume Designers Guild Award for The Starter Wife (2007), as well as winning the AACTA Award for Best Costume Design in Television for Miss Fisher's Murder Mysteries (2013). 'The Dressmaker Costume Exhibition' is open daily 10am - 4pm from Thursday 18 April until Sunday 18 August 2019. Bookings are essential: click here to make a booking. Prices are as follow: $13 general admission, $10 concessions & Friends of the NFSA, $7 children (5 and up). Note: Every Friday at 1pm, there will be a FREE floor talk in the gallery about the exhibition. You can also celebrate International Museum Day at the NFSA on Saturday 18 May with FREE entry to The Dressmaker Costume Exhibition for ages 17 and under. Other special events coinciding with the exhibition include In Conversation with Jocelyn Moorhouse: Book Signing & Screening, a spectacular 1950s Vintage Ball and Mother's Day Event with a glass of bubbly, cupcakes and guided tours. Plan your visit now by heading to nfsa.gov.au, facebook.com/nfsaa and @nfsaonline. When: Bookings essential: $13 general admission, $10 concessions & Friends of the NFSA, $7 children (5 and up). Cost: Bookings essential: $13 general admission, $10 concessions & Friends of the NFSA, $7 children (5 and up).